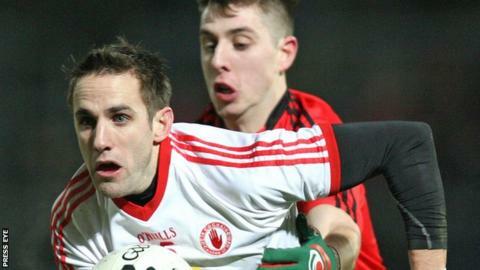 Tyrone held off Down in a fiery opening Division 1 Football League encounter at Pairc Esler. Down led 0-7 to 0-3 after 25 minutes as Tyrone looked unusually lethargic. But Tyrone cut Down's lead to two by half-time and drew level early in the second half before Mark Donnelly netted to put the Red Hands three in front. Donal O'Hare immediately palmed in a levelling goal but Tyrone continued to control the contest despite Joe McMahon's dismissal. Down were also reduced to 14 players in the final minute of normal time after Conor Laverty received a second yellow card. Tempers boiled over on a number of occasions with players and personnel from both benches appearing to get involved in pushing and jostling near the dugouts. Sean Cavanagh opened the scoring for Tyrone in the first minute but the Red Hands were decidedly second best during the opening period. Points from Benny Coulter (two), Connaire Harrison and Donal O'Hare (two) helped edge Down into a 0-5 to 0-2 lead. A 45 from new goalkeeper Niall Morgan got Tyrone scoring again but Down were dominating midfield and wing-back Ryan Mallon stormed upfield to slam over two points in quick succession to extend the home team's lead to four. Crucially, Tyrone hit the last two scores of the half with keeper Morgan slotting his second successful 45 in injury-time. An immediate Stephen O'Neill point after the break was cancelled out by another O'Hare point, but Tyrone were a different team after the interval. Down had dominated midfield in the opening period but it was a different story after the break as Tyrone upped their work-rate and the Mournemen appeared to have no answer. By the 48th minute, Tyrone had levelled at 0-8 to 0-8 - helped by two O'Neill points - and it then got better for the Red Hands as Mark Donnelly netted after a clever fisted pass by the impressive Conor McAliskey. Down immediately drew level as O'Hare palmed to the net after an unselfish pass from Harrison but Tyrone quickly regained control even though McMahon was sent off shortly after the Mourne goal. Home midfielder Kalum King had appeared fortunate in the first half not to be sent off after a high tackle on McMahon even though he had already been yellow carded. McMahon didn't enjoy the same leniency although he had appeared to have been involved in some off-the-ball afters in the incident which led to his second booking. But despite McMahon's departure, Conor Clarke, Cavanagh and full-forward O'Neill added further points to secure a deserved win for the Red Hands.